← Holy Windy Day, Batman! So, we’ve invited some friends over – sometimes totally last minute, sometimes months in advance. Now, I have to decide what the heck I’m going to make. If my guests are “regulars”, I know what they like and don’t like; if they are “new”, I ensure to find out ahead of time if there is anything they don’t like or can’t eat (because I do not like it when my food is not enjoyed)! More importantly, there no way anyone is leaving my house after one of my meals, needing to stop off at McDonald’s on their way home ‘coz they’re hungry! 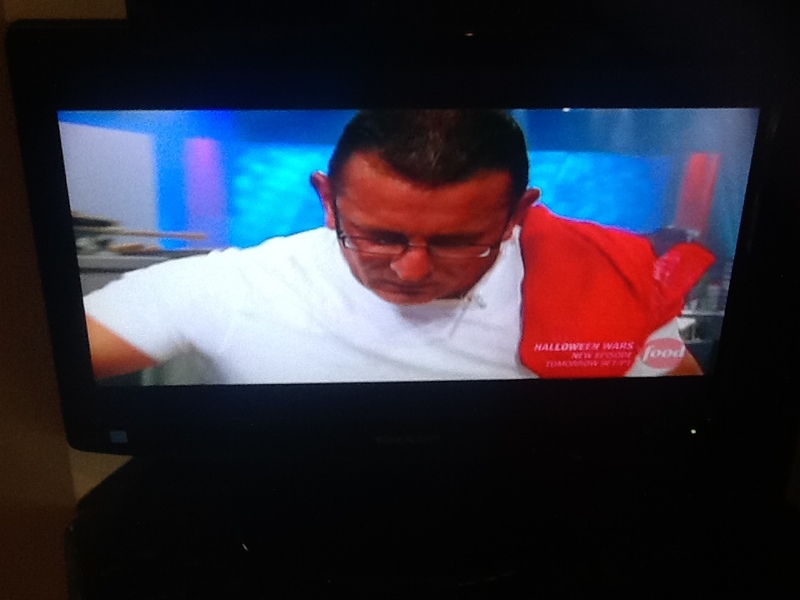 My kitchen TV is tuned to Food Network Canada (pretty much always) for inspiration and just because I love watching cooking shows like Chopped or Iron Chef America (and I frankly don’t care if it’s a repeat or not, I’ll re-watch it – as was the case this Saturday – Robert Irvine and Cat Cora were competing against Michael Symon and Anne Burrell, who won) while I chop, dice, sautée…. There was a nice special on Frenched pork roast at one of our local grocery stores so that was the protein de choix for the evening. Hubby suggested the menu should be comfort food as our guests were going through a rough time with a sick parent. André loves my carrot-bacon soup so, though I don’t like to repeat, I did make that. Tammy is a potato-holic so for sure garlic mashed potatoes were also on the menu. Hmmm… what veg to go with? I had some nice purple carrots so, tossed them à la Jamie Oliver with rosemary, garlic, olive oil, wine vinegar and salt & pepper and onto the heat they went to be roasted. I cannot believe I forgot to take a picture of my beautiful roast. Dang! I had a fabulous rosemary, pepper, fennel seed crust on it. 😦 Guess I’ll just have to remake it and take a picture for a future post! I shouldn’t feel too bad, it does mean I was busy spending more time with my guests than with my camera…. I do enjoy making fancy desserts, but in this case, Mick asked for an apple crisp. Who was I to say no? 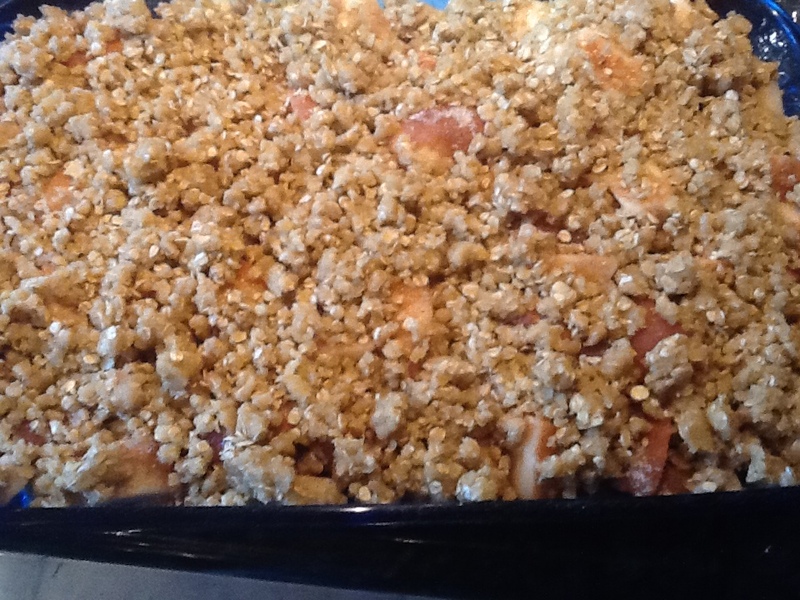 And who doesn’t like cinnamony bubbling apples, covered in a nice oatmeal streusel, with a scoop of ice cream on top? Who? The neighbour passed by with a case of beer, and when he found out we were having company over, tried to leave. We told him it was way early yet, the guests wouldn’t arrive until 5:30-6:00 so really, no rush! When the did show up, we told him to go get his wife and at least come back a glass of champagne! While we were sipping said bubbles, I rearranged the table settings to add three people (their son was also invited, of course!) They did try to protest but, with our irresistable charm, and the assurance of Tammy and André that they were more than welcome to crash, they relented and stayed – though Robert did insist on bringing some of his fabulous roasted peppers! A good time was had by all and no one left with an empty belly! The next day, looking in the recycling box, I understood why my head ached a bit…seemed like there were far too many empty bottles of wine in there! 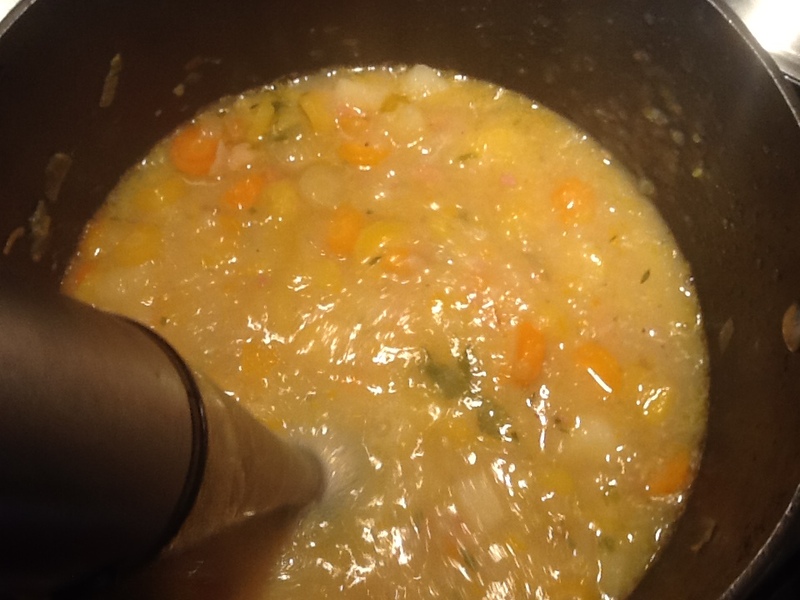 This entry was posted in Food and tagged apple crisp, carrot-bacon soup, entertaining, garlic-mashed potatoes, pork roast, wine. Bookmark the permalink. I am not much of a cook… I love to bake but do not have the patience for cooking. Sounds like you had a great time. It is where I am happiest – the kitchen, that is! Usually, my guests are my guinea pigs! Actually, pork-wise, they were but the rest of the recipes were pretty much tried and true. It was most definitely a great time! Oh boy, Dale, what a feast! Your telling of it actually makes me feel less anxious about being in the kitchen. CJ is definitely the more culinary of the two of us, and even he would rather have a five minute preparation meal. We have made meals for friends, but it is never the way you make it sound. I’m so glad you have found this love and are able to share it with others! Imagine, Tammy, this was not my usual “over the top” meal! It was actually almost a mid-week-type of meal! Man, you guys know how to do it right!!! An extravaganza, really. Tammy makes it appear as if I have a clue in the kitchen, but we all know it to untrue. I do know how to consume alcohol, however, especially IPAs and pale ales. But I love a good red too. May you and your guests party your lives away. I cannot think of time better spent! Thanks CJ! You know, it’s funny (sad?) some people are afraid to have me over for a meal… Sigh… I keep telling them I care not what you serve me: order a pizza if you must; boil me a hot-dog, if you want, seriously! The important thing is getting together with friends and family to share an evening/afternoon/whatever of laughter (and we do a lot of that!) It’s my thing to cook all sorts of food. It’s what I love to do and my way of showing my love. Oh, and we do love the IPAs and pale ales as well! (I am partial to reds but Mick likes the blonds more.) When we were in Chicago, I found Dale’s Pale Ale! What a hoot and a half! Is it silly I was so pleased? Dale, I have to tell you that CJ just recently said, “Do you think Dale has ever heard of Dale’s Pale Ale?” He got a real kick out of himself and now you’re here saying just that! It’s one of our faves!